This Gallagher H.T. wire features special properties and a minimum product guarantee of 10 years. 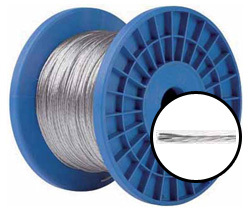 This wire is many times better than any other steel wire. An aluminium coating over the 2.5 mm core provides superior conductivity, up to 15 times higher than ordinary 2.5 mm steel wire. The wire’s tensile strength is very high too: up to 500 kg. This wire can be tightly tensioned and in combination with tension springs a distance of 20 metres between posts is possible. This greatly reduces your costs per metre as you require much less material for a reliable and durable fencing system. A conductive plastic cable, designed for horse fences. 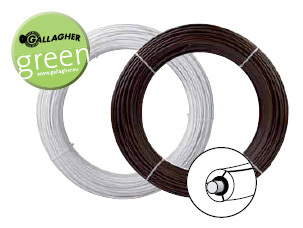 Gallagher gives a minimum of 10-year product guarantee on Equifence. This is the most durable and safe Gallagher fence for horses. Equifence is an elastic cable with a galvanized core. The 3mm plastic covering protects the horse against the zinc-aluminium core. The plastic cable conducts electricity due to three carbon lines that are in direct contact with the core. We recomend that Gallagher EquiFence is installed by a professional. 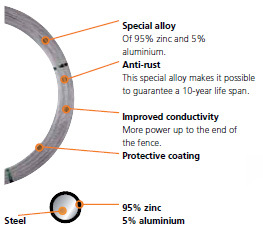 Erecting a permanent fence becomes very simple with this aluminised fencing wire. Easier to bend than regular HT wire, but strong enough to keep sheep, cattle or game in/out. 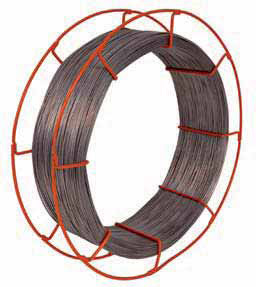 Very low resistance, which makes this wire ideal for long fence lines. 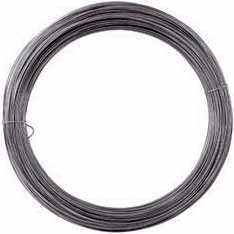 Steel cored, high tensile fence wire with an aluminium coating for longer life and greater conductivity. Permanent Wire Tensioner and Tension Springs can be used to strain the wire. The safest solution for your horse. Unique electrically conductive polymer (in black stripes) allows use as electric fence wire. Provides you, in combination with tension springs, ultimate safety for your horse. Total diameter of 8mm with a core of 2.5mm high tensile wire.